In a never ending quest to find Tungsten Rings that are unique and personalized just to you, we’ve found a very interesting design from the consummate professionals at Ring Ninja. 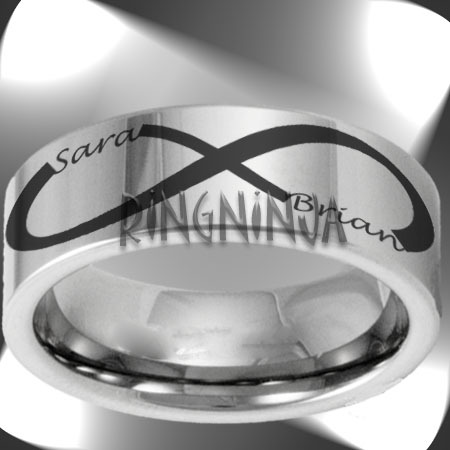 This particular Tungsten Band has a laser etched infinity pattern that contains both you and your partners name! As seen in the picture there is a spot for Name 1 (the top left hand position) and Name 2 (the bottom right hand position). We did take the time to contact customer service and had a few questions to ask about this pattern, and if it could be further customized. When asked if we could do just one name, the answer was yes. The friendly customer service agent told us to either send an email with our request, or just call it in and they’d be happy to place the order for us. We also asked (and this probably has a pretty obvious answer) if the names had to be names – the answer was no – so in theory we could put any words we want in there, possible creating a ring with our favorite sports team, showing our eternal love for perhaps our Detroit Tigers, or even the Chicago Cubs.. or if you are the type of person who is really dedicated to desert, you could show your eternal love for cake and ice cream! Currently in tungsten, the rings come in 6MM and 8MM. There are products on their site for pipe cut styles, however as told by customer service this can also be done in domed, and on just about any other style as long as they have the room to put the engraving on the ring. So remember if you are looking for a truly unique way to show your ever lasting love consider getting this tungsten wedding band with the very nice looking – and very symbolic infinity symbol design! Are you an avid outdoorsman? Perhaps you are passionate about hunting and love everything to do with it. This may be the ring for you. 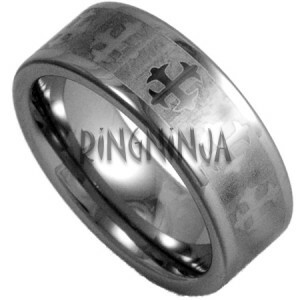 Not only is it made out of Tungsten Carbide so it’s sure to take a beating and stand up to scratches better than any other jewelry material in production today, but it will blend into it’s surroundings with it’s laser etched camo pattern. The laser etching on this ring isn’t like any other we’ve seen before. The effect of light and dark in the camo pattern is very unique. If you’ve been in the market for a camouflage ring to fit your outdoor lifestyle, than this may be the one for you. 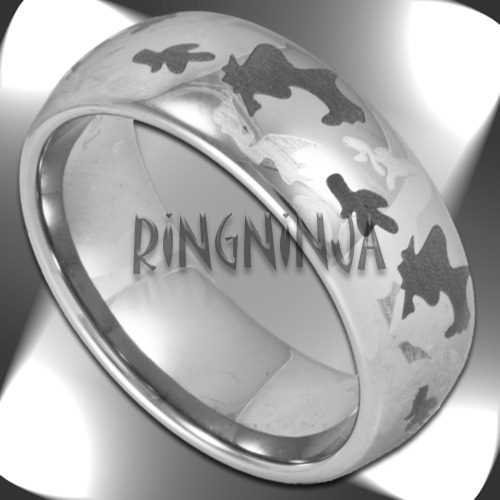 You can find this ring currently in 8 millimeter width here: http://ring-ninja.com/tungstenringcamo-rntu086.html also remember that Ring Ninja will offers a lifetime warranty on all of their tungsten rings. This ring can also be custom engraved on the inside with a message of your choice for just $24.95! Below is the description from their website – Happy Hunting! This is one of the most unique wedding rings that we’ve ever seen here at Tungsten Ring Review! This Tungsten Wedding Ring features a slim, flat profile – what’s known as a pipe cut ring in the industry. The laser etching really shows up great on this ring, the picture doesn’t even do it justice. If you’re into the Celtic Cross look we’d totally recommend this ring. Since the ring is made of Tungsten Carbide it will last a lifetime, and will always look polished. Unlike some rings we’ve seen with a ‘brushed’ finish, this one just doesn’t seem to get dirty, there are no grooves so the ring really doesn’t require cleaning at regular intervals at all.